Age 6+ A variety of styles from Classical to Contemporary, Pop, Disney, and Musicals etc. Exam preparation for RIAM (Royal Irish Academy of Music), Trinity Guildhall and ABRSM Exams available. Ages 6+. A beautiful instrument but they have a squeaky start to getting the notes sounding clear. Violins are available for rent in different sizes to suit the size of the musician. Exam preparation for RIAM (Royal Irish Academy of Music) and ABRSM Exams available. Ages 5+. This is a very good instrument for studying theory. It is very easy for beginners. A beautiful sounding instrument. A variety of styles from Classical to Contemporary available. Available for private lessons only. Exam preparation for RIAM (Royal Irish Academy of Music), Trinity Guildhall and ABRSM Exams available. Ages 5+. Taught the same as the Piano initially as the finger work is the same but the Keyboard allows you to play beats and special effects. Available for both group and private lessons. Musicians at Grade 8 level + who want to improve their ability to play freely and creatively. This class focuses on increasing aural awareness and aural skills to give the student the ability to improvise, build chords, arrange popular pieces with your own harmonies, play by ear, transpose etc. Ages 10+. Easier to play, lighter and more controlled than the traditional flute. It is also more intricate and has more dynamic variations than the traditional flute. There’s a bit of stretching involved to reach the holes and lung capacity is required which is why the age is set at 10 years, although depending on the height and strength of the student we may take younger. We have had an 8 year old flute student. A good start would be to learn the tin whistle first although there is slightly different finger work. Available in group classes or private lessons. Exam preparation for RIAM (Royal Irish Academy of Music) and ABRSM Exams available. Ages 9+ A wonderfully flexible instrument, compared to some other wind instruments the Clarinet is an easy instrument to get started on and with careful practice of the embouchure rapid progress can be made. Equally at home in Classical and Jazz the Clarinet provides the student with many exciting musical opportunities. 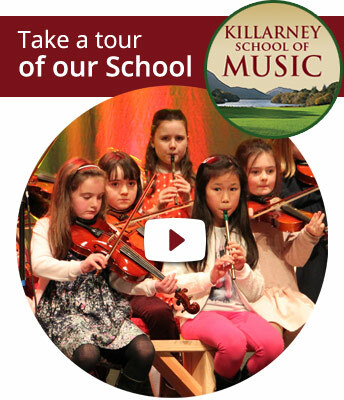 RIAM (Royal Irish Academy of Music) and ABRSM Exams available. Ages 9+ The Saxophone shares many technical traits of the Clarinet but, crucially, has a different embouchure. As with the Clarinet, once tone production is well practiced and secured rapid progress can be made. Due to the weight of the instrument 9-10 years of age is usually the best time to start. The Saxophone is a very adaptable instrument and is heard in a great variety of styles and genres making it a very exciting and interesting instrument. RIAM (Royal Irish Academy of Music) and ABRSM Exams available. Ages 7+. A wide variety of genres covered. Acoustic Guitars are available for rent in different sizes to suit the size of the musician. Exam preparation for RGT (Registry of Guitar Tutors), RIAM (Royal Irish Academy of Music) and ABRSM Exams available. Ages 7+. A small 4 stringed instrument. Easy to play nylon strings. Pleasant on the ear. . A wide variety of genres covered. Ages 5+. Wonderful sounding instrument that’s always pleasant on the ear. Harps are available for rent. Exam preparation for RIAM (Royal Irish Academy of Music) and ABRSM Exams available. Ages 4-5. It’s a fun introduction to music, designed to introduce the child to the fundamentals of music. This class is useful to help children decide which instrument they might like to learn at a later stage. Group classes available only.